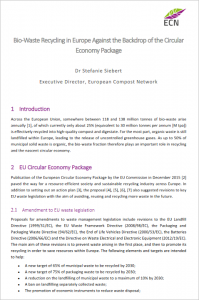 Across the European Union, somewhere between 118 and 138 million tonnes of bio-waste arise annually [COM/2010/0235 final], of which currently only about 25% (equivalent to 30 million tonnes per annum [M tpa]) is effectively recycled into high-quality compost and digestate. The majority of municipal waste generated in Europe is still disposed of through landfilling (31%) or incineration (26%), with less than half (43%) recycled [ COM (2015) 595 final 2015/0275 (COD)]. According to the European Environment Agency (EEA 2013) [EEA Report No. 2/2013. Denmark], the recycling of glass, paper and cardboard, metals and plastics has increased in recent years. On the other hand, there has been no corresponding increase in bio-waste recycling. Using EUROSTAT municipal waste data [http://ec.europa.eu/eurostat/data/database], and assuming that about 40% of municipal waste is bio-waste, this means that somewhere in the region of 96 million tonnes of bio-waste from municipal waste is created every year across Europe. A recent survey by the European Compost Network indicated that in 2014 only about a third (30 million tonnes) of this was separately collected and composted and/or digested. Notably, these figures exclude the significant quantities of food residues (41 million tonnes) [www.eu-fusions.org] which are produced industrially during food manufacture. 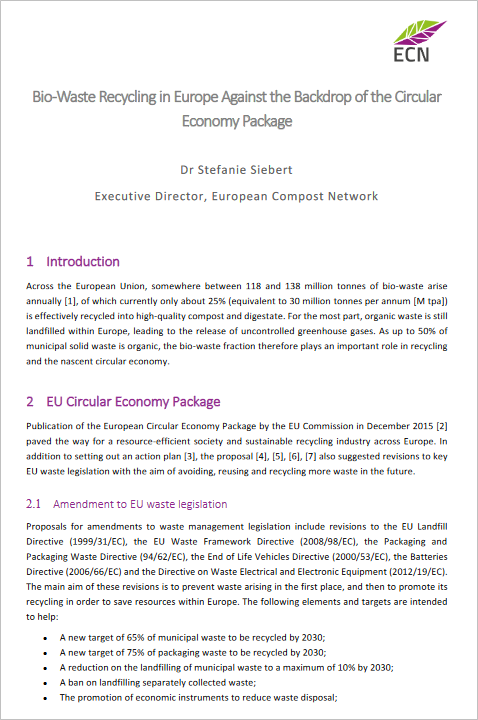 The article ‘Bio-waste Recycling in Europe Against the Backdrop of the Circular Economy Package’ can be accessed here.